ZR NYC – Zombies, Run! 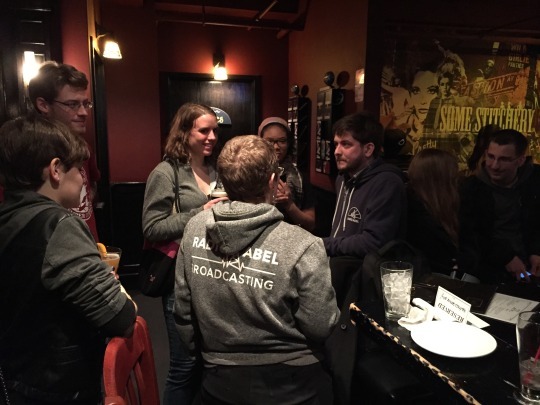 Picture the scene, if you will: exactly a week ago, a lovely bar in Midtown Manhattan, and the night closing in as a veritable horde of Runners 5 gathered to trade running stories, compare feels and discuss every possible aspect of everyone’s favourite post-apocalypse running app. It was the first ever official Zombies, Run! New York meet up and it was bloody wonderful. 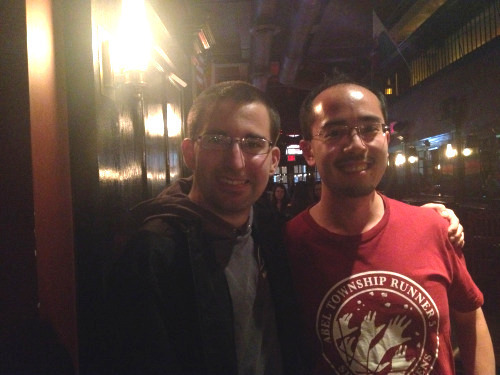 Sean Palladino and Adrian Hon (Six to Start CEO & ZR co-creator). Image courtesy Sean Palladino – thanks Sean! This is a post to say thank you to everyone who turned out to say hi to us, and to share a few glowing memories with those of you who couldn’t make it. You are all awesome, and it was unbelievably wonderful to meet so many fans of ZR and to put faces to names! Swapping running stories. Image courtesy Adrian Hon – thanks, Adrian! Hearing everyone’s stories of getting fit with Zombies, Run! – you are all huge inspirations! Dorking out about some of my favourite pieces of fan work with their creators. Swapping Radio Abel playlist stories, especially the song Jack and Eugene met to. Pretending to understand the conversation while Alex (ex-ZR lead developer) talked mobile app development with some of the runners. Watching people react as Adrian gave out sneak peeks of ZR4. Sharing some of my favourite recording stories about how amazing all our wonderful actors are. If you were there, let us know what your favourite part of the night was in the replies! Previous Post Supply Box Sale!